Hey all, sorry for the frustration of late with the website. I’m not entirely clear on what happened to cause the downtime and the subsequent issues we’re having with access, but I think we’re close to having it licked. One thing we’ve done already is move to a new server. Soon, we’ll be making a few other changes and in the end there will one url to rule them all. So, this is about bookmarks. Some of you have superfogeys.webcomicsonline.com bookmarked as your access point for this site. That url no longer works, so you’ve may have found yourself unable view the site of late. 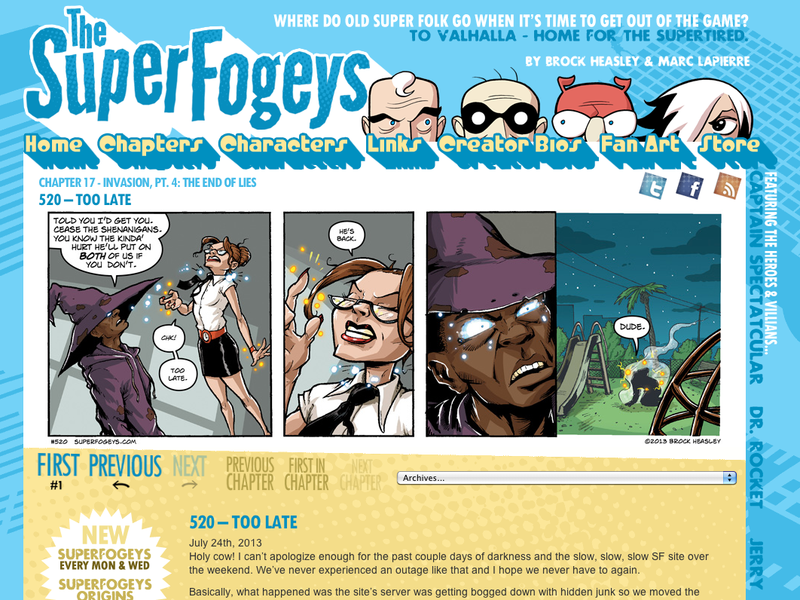 Here’s how you solve this: switch your bookmark over to superfogeys.com right now. That url will always, always work, no matter what and it is our main url going forward. For a lot of you–maybe most of you–this isn’t an issue, but for those who are having trouble, that’s the solution. Site should be lightning fast after that.